Your name came up by Fitz Brundage, the panel’s chair: your memorable line begging historians to stop writing hagiographic books about the founding fathers. Big, appreciative laugh in the room. Here’s a suggestion, boys: just stop writing about the so-called “Founding Fathers!”Stop it! Stop! Go find something new, interesting, and utterly undiscovered in the archives, for a change! But then, there have been so many posts to this effect on this blog that it’s difficult to pick just one! Speaking of which: you recall my recent discovery that William Lloyd Garrison was even more relentlessly impious about the so-called “Founding Fathers” than I? 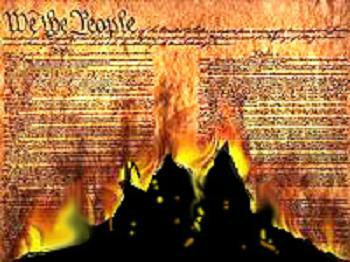 Did you know that that bad-assed motherf^(ker burned a copy of the U.S. Constitution in public at an anti-Kansas-Nebraska Act rally in 1854, calling the Constitution itself “a covenant with death, and an agreement with hell?” I’d like to see a prominent reformer or activist do that today, but so-called liberals and progressives today are a generation of appeasers and go-along-to-get-along-ers. File your reports from on the ground in Milwaukee in the comments below, you not so bad-assed motherf^(kers. ← 4-20 and loaded .44s: guess which one isn’t welcome on campus? Maybe for my big public gesture, I’ll burn the check I’m offered for my hagiographic bio of Alexander Hamilton. Take that, motherf^(kers! Thanks for passing it along, CE. I always had an unnatural fondness for Elbridge Gerry. I have no idea why. Hysterically, I just realized he has a facebook page: https://www.facebook.com/ElbridgeGerry with a whopping 117 likes — 6 figure advance, here I come. Whut Made Milwaukee Famous ™ was definitely not founding fathers, unless we’re talking the founding fathers of various macro-breweries, or renegade baseball leagues in the nineteenth century (who in some cases were the same people). I’m not in Milwaukee too, but if I had to guess I’d say it was a laugh-with, not a laugh-at. Maybe you could get a four-figure advance–I mean fellowship stipend–from publishers by promising to stop trashing founding fathers here, on their prudential calculation that even the miniscule chance that you might someday, somehow, ruin the market with the reading public for hagstuff is worth at least a $9,999 inoculatory shot?